Do individuals have a positive right of self-defence? And if so, what are the limits of this right? Under what conditions does this use of force extend to the defence of others? These are some of the issues explored by Dr Uniacke in this comprehensive 1994 philosophical discussion of the principles relevant to self-defence as a moral and legal justification of homicide. She establishes a unitary right of self-defence and the defence of others, one which grounds the permissibility of the use of necessary and proportionate defensive force against culpable and non-culpable, active and passive, unjust threats. 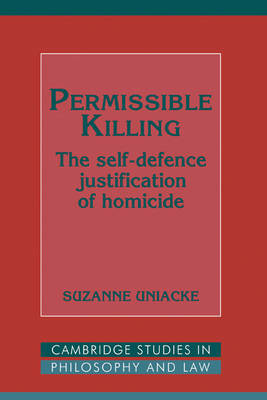 Particular topics discussed include: the nature of moral and legal justification and excuse; natural law justifications of homicide in self-defence; the Principle of Double Effect and the claim that homicide in self-defence is justified as unintended killing; and the question of self-preferential killing. This is a lucid and sophisticated account of the complex notion of justification, revolving around a critical discussion of trends in the law of self-defence.